The calendar has finally answered your prayers: Memorial Day, the unofficial start of summer, is here. Along with summer Fridays at work, BBQs, and pool days, there's one thing I'm looking forward to most this season: busting out all my favorite sundresses—and now there's one in particular that I have my eye on. While perusing Net-a-Porter's new arrivals section, I was definitely tempted by some of the stunning designer pieces, but when I landed on a super-cute Madewell dress, I knew I had to have it. (Who can spend four figures on a dress you're inevitably going to sweat in, anyway?) 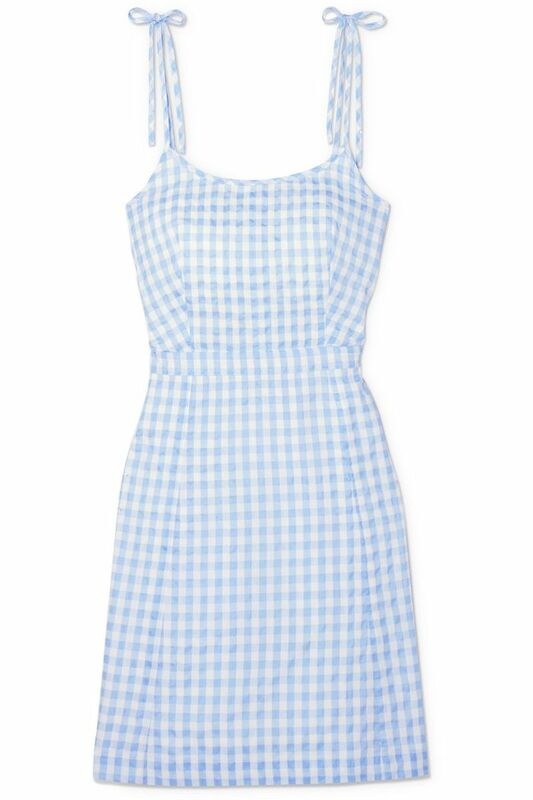 Ringing in at $100, the Madewell Gingham Cotton-Blend Mini Dress piqued my interested because of the tie straps, the baby blue color, and the easy-to-wear A-line shape. What more could you ask for in a dress, really? I'll be wearing it with white sneakers for the foreseeable future. Scroll down to shop it, as well as other Madewell finds I think you'll love.